Matcha powder is the one of the most healthy green teas out there because you drink a powdered form of the actual tea leaf, unlike regular green tea which is simply an infusion of the leaves. 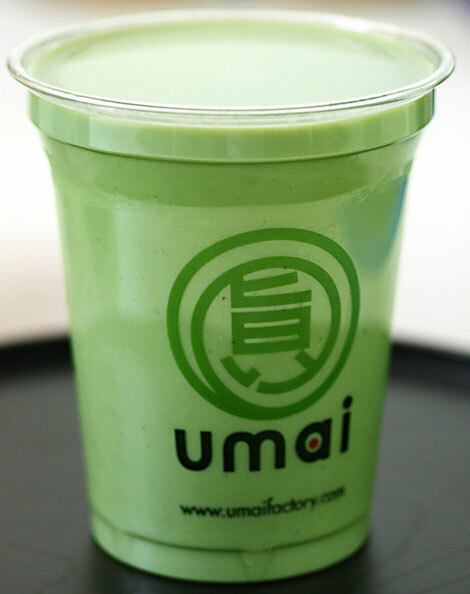 Matcha goes perfectly with milk thanks to its smooth taste and is delicious hot or cold. It also contains some caffeine, so it will give you an instant pick me up at any time of day. 1. Spoon the Matcha Green Tea Powder and the sugar into a mug or cup. 2. Add the warm water and mix either with a spoon or with a whisk until it is a smooth dark green paste. This is to stop the tea having lumps in it. 4. Use the whisk to mix the paste and milk together until it is smooth and light green in colour. Now it’s ready to drink! Also available Hot or Cold at the ‘umai’ deli counter in Japan Centre store on Regent Street. Posted in Food and tagged matcha, recipe. Bookmark the permalink. I love Matcha Green Tea. This is a great recipe you could always try throwing in a banana to make a delicious Matcha banana smoothie!